CDH Family Assistance Fund – A majority of this fund will go to help families with travel expenses such as airline tickets and gas. It will not go to lodging because CHERUBS highly recommends the *free* lodging available at Ronald McDonald Houses. Families will submit confidential applications to assistance and a committee will consider each request. Our goal is to make sure that all CDH families can afford to get to their cherub’s medical center and have a place to stay so that they can concentrate on their children instead of travel worries. We hope to assist a family through this fund by this fall. The remaining small percentage of this fund will go to Gabe’s Gifts, a new program that helps new and expectant families by supplying them with items needed. This project will start by September, 2009! CDH Research Fund – to pay for the $1000 a year cost of research database hosting and to raise money for research organizations such as the International CDH Study Group – unless a request is made to go a specific hospital. The CDH Study Group is a collective group of over 30 hospitals around the world specializing in CDH research. We chose to support groups like this one because we know that every cent will go directly to research on Congenital Diaphragmatic Hernia and research will be brooder and more advanced when collaborating with dozens of hospitals and researchers together. CDH Research Site – funds for the software needed to create and maintain secure database hosting for our CDH research database. This database includes information on over 2400 CDH patients and medical care providers – offering a very unique opportunity to research the cause, prevention and best medical treatments for Congenital Diaphragmatic Hernia. Such software and off-site security that is needed for an undertaking this large costs approximately $1000 per year (thanks to a grant from QuestionPro). Rather than take funds out of our very small operating cost budget, we are appealing to members and the public to help fund this research venture. Site maintence, design and statistics is being done for free by volunteers. $1000 per year is needed solely for the database design and secure hosting, which is needed to follow federal privacy and HIPPA laws. This web site is a project of CHERUBS – The Association of Congenital DIaphragmatic Hernia Research, Awareness and Support. It is supported by volunteers and funding through CHERUBS, a 501(c)III Non-Profit Organization. Donations and sponsorships are greatly encouraged and appreciated to help keep this CDH Reseach site continuing, growing and leading the search for the cause and prevention of CDH. CHERUBS Congenital Diaphragmatic Hernia Research Survey is the combined efforts of over 2000 CDH families and medical professionals. It takes information on the medical, family and exposure histories of CDH patients and compares data to look for the cause, prevention and better treatement of Congenital Diaphragmatic Hernia. Participation is voluntary, anonymous and free to all CDH families and medical staff. Data can be tabulated live for research and reference purposes. Congenital Diaphragmatic Hernia (CDH) is a birth defect that occurs when the diaphragm does not fully form, allowing organs to enter the chest cavity preventing lung growth. CDH strikes 1 in every 2500 babies, of all races, religious backgrounds, and financial status – no matter how well the prenatal care. Nearly 4 million babies are born in the United States each year. This means that approximately 1600 babies are born with CDH each year – in the U.S. alone! There are more babies born with CDH than with Cystic Fibrosis (1 in 3900) and it’s almost as common as Spina Bifida (7 in 10,000) – yet, you probably have never heard of it until it affected someone that you love. CHERUBS is working hard to raise Congenital Diaphragmatic Hernia Awareness! The cause of Congenital Diaphragmatic Hernia is not yet known. 50% of babies born with CDH do not survive and sometimes the remaining 50% have to overcome very difficult medical complications. Many CDH babies have minor lasting health problems such as feeding aversions, asthma, scoliosis, or short-term oxygen dependency. A small number have major lasting health problems such as ventilator dependency, brain damage, or hearing problems. Many patients have no long-lasting medical problems at all other than a scar from the CDH repair. CDH can occur alone or with other birth defects, and rarely, it occurs as part of a syndrome. CDH Scholarship Fund – for CDH survivors and siblings. Families can raise money to give scholarships in honor / memory of their cherubs. We hope to award our first scholarship in 2010. An application form will be posted soon. 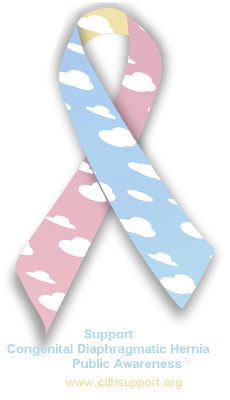 CDH Awareness Fund – this fund will help raise awareness of Congenital Diaphragmatic Hernia through balloon releases, giving away free CDH ribbon buttons and brochures and other items. It will also cover advertising costs, billboards, video production and much more. CHERUBS subsists off of donations. Though we are trying, we currently are not receiving any grant funding and all donations go to help us continue our work in research and offering services and information to families and medical-care providers of children born with Congenital Diaphragmatic Hernia. We are run strictly by volunteers, no one gets paid for working for CHERUBS, so every penny of your donation will directly help families. CHERUBS is an IRS recognized 501(c) Non-Profit Organization and all donations are tax-deductible. Donations are tax-deductible and much appreciated to help us continue to help CDH families!